AM- Short speed workout this morning. 2 mile warmup on Aggie, 8 x 400m in 83-84, then 4 miles cooldown on Aggie. Felt pretty easy aerobically, but still gotta work on that turnover. AM- 10.2 miles easy starting from the park, out to Naples, then back. 7:24 average. Humid and cloudy this morning, which hopefully means rain this week. AM- Easy mile loops around home. 7:33 average pace. It is still wet and rainy, so I am hoping that I don't get rained out for tomorrow's long run. AM- Wasn't really feeling too good this morning, so I just went easier. Went out towards Buckskin then back towards town and down Maine. Right around 7:30 average. AM- 3 mile warmup, then right into a 3 mile tempo. Splits were 5:48, 5:48, 5:42. Mostly been running easy all week, so it felt nice to get in something faster today. Averaged faster for this tempo than last time on this route, which is promising! Easy miles afterward. PM- Awesome evening run starting from Aggie. 5.3 miles at 7:05 average. Felt like I had a great runners high moment tonight. AM- 11.2 miles on the TM. A little too cold outside this morning, and I don't want to take a chance of getting sick this week. First treadmill run in awhile. PM- 6.1 mile shakeout. Started to get dark pretty quickly, which made things a little spooky towards the end. 7:39 average. PM- Easy miles with a 3 mile tempo in between. Splits were: 5:56, 5:55, 5:51. Felt really good and controlled throughout. Cooldown to home afterward. AM- 6 miles up past Legacy Park and back home. Picked the pace up some on the way back. 7:25 average. PM- 4.2 mile shakeout after work. 7:10 average. AM- Easy shakeout run towards Naples and back. Several strides afterward. Excited for tomorrow and see if I can improve my time from last year on this course. Also looks like the weather is going to cooperate quite nicely, which is great! AM- Woke up quite a bit earulier than I normally do for races, like 4 am. For some reason I just wasn't very tired. Got on the bus at about 6:30, and was up to the starting line by 7. The race didn't start until 8:30, so it was a little annoying having to stand around up at the starting line for an hour and a half, but it wasn't very cold for the race this year. Ran into a fellow Uintah xc/track runner Luke, who had a really good race and personal best today, so S/O to him. My goal for this race was to keep my mile splits as consistent as possible, and be able to run a better time than last year, which I knew I was easily capabable of doing, based on my fitness over the past few months. Miles 1-3 were right where I wanted them to be, and they felt quite comfortable overall. 5:45, 5:46, 5:48. For miles 4-7, I am feeling strong, and the miles seem to be going by quite well. 5:41, 5:41, 5:43. During miles 8-10, I was able to pass a couple of guys that went out really fast, I from the start I had a feeling that someone in front of me was going to fall off their pace. There was one guy though that I basically could see for most of the race ahead of me by about 100 meters or so, just couldn't quite reel him in. Anyway, mile splits 8-10 were strong with 5:35, 5:38, 5:49. 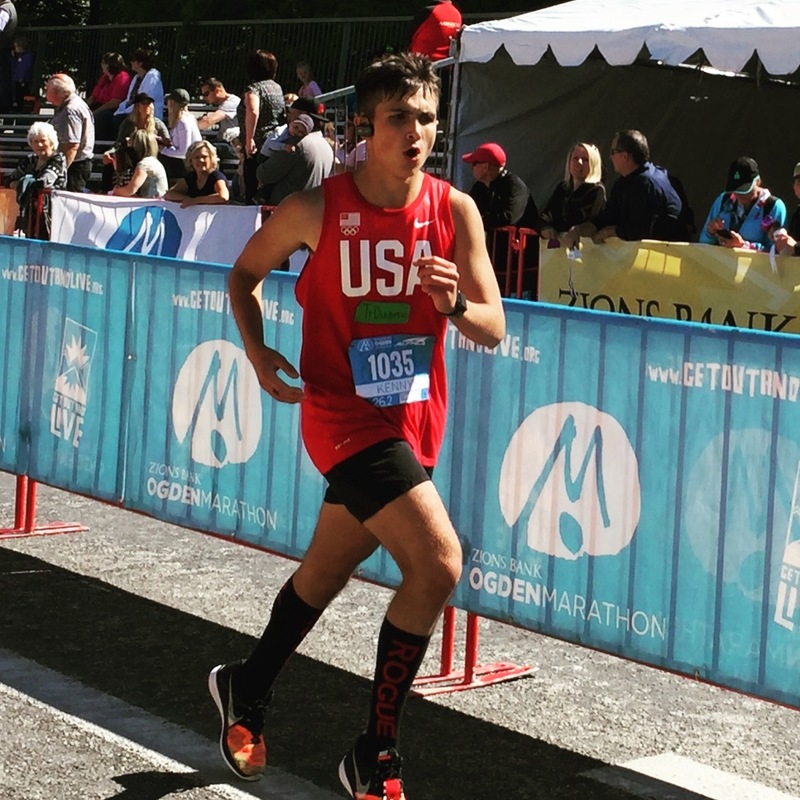 After this, I felt like I was started to have a few rough patches on being able to focus on my pace, and fell off just a bit from what I held during the previous miles of the race. Continued on to finish in a new personal best and a 3 minute improvement from last year on this course! Mile 11-13 splits were 5:48, 5:50, 5:51. Overall stoked about my performance today, and I was able to keep mostly consistent splits. Legs feel pretty beat up now and are quite sore to say the least. Gonna take it easy for the next couple of days, and then get ready for Las Vegas Marathon coming up soon! No running today, even though I was tempted to go for a little shakeout run this afternoon, but I decided to give myself a day of rest. I was really sore after the race yesterday, until I was able to get a good meal in me. Went to the USC @ Utes game yesterday, which was a blast! AM- Recovery miles up to Maine and down to Naples. 7:51 average. Legs were cramping a bit at the beginning of the run. AM- 11 miles from the rec center. Did about 5 miles with Ty, then did some more miles solo. 7:31 average. Felt much better today than yesterday. AM- Easy with 3 miles at marathon pace. 6:41, 6:24, 6:25. Legs are still sore from the half, but overall felt really comfortable. PM- 7 miles easy. My right quad felt really sore in the middle miles of this run, but started to feel better as I kept going. Still kepted the pace pretty slow with 7:53 average. AM- 6.1 miles from Maesar to home. Legs were cramping a lot during this run, and I know it is from the Haunted Half but I don't know why they are starting to get worse now verses earlier in the week. Might end up doing a shakeout later and taking the rest of the week off, which is frustrating but I don't want to get injured. PM- 3.7 mile shakeout on the TM. Felt much better this evening than I did on my morning run. Took some ibuprofen and have been drinking plenty of water as well. AM- Easy 12 today. 7:33 average. Quad felt better on this run. A little tightness towards the end, but nothing major. Gonna RICE it some later today. AM- 9.1 miles @ MP 6:36 average. It was a little chilly out this morning, so it took a little longer to start feeling good. Last longer effort at marathon pace before Las Vegas. 2 mile cooldown afterward. PM- 4.1 mile shakeout from home. 7:40 average. Really beautiful night for a run! AM- 5.2 recovery miles on the Brush Creek Trail. Cold and breezy out this morning. 8:16 average. PM- 6.1 miles in between math sessions. 7:50 average. AM- 11.5 miles easy on the TM. Quite a bit colder outside today. 7:34 average.